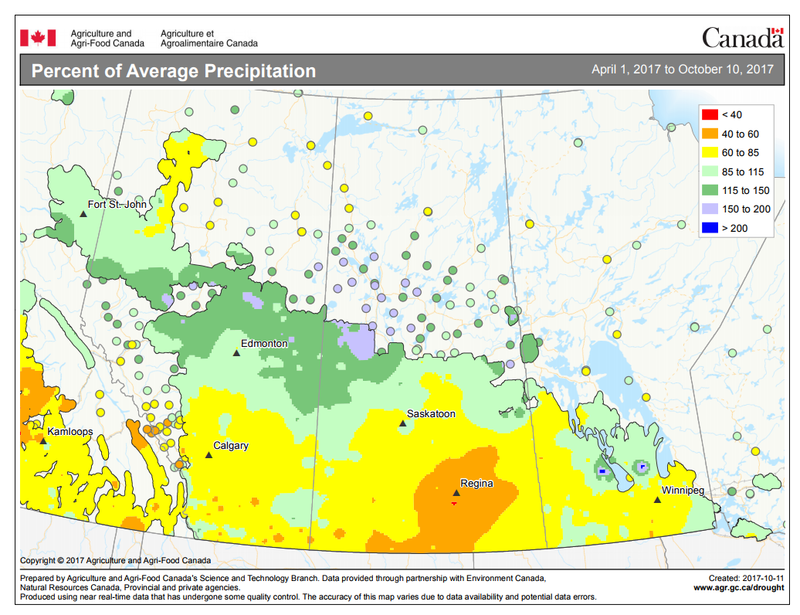 The 2017 growing season saw a departure from average precipitation, with much of the flax growing regions of the Prairies seeing 40 – 85% of average precipitation (figure 1) and now sitting at average to 10% below average soil moisture in the upper 5 centimeters for soil (figure 2). How does lack of soil moisture affect management decisions? Flax is a shallow rooted crop, with the bulk of the roots in the upper 70 cm of soil. This results in proportionately more drying in the upper soil layers, but leaves more moisture at depth. We often think about what crop stubble we should be putting our flax on but what about which crops to plant on your flax stubble? This could be an important question for 2018 due to dry conditions, although still largely dependent on snowfall and spring 2018 precipitation. In the Brown and Dark Brown soil zones, long term research (1967 – 1984) indicates that spring wheat tends to have lower yields after flax than other crop types (wheat, rye or oat hay), and was attributed to below average precipitation during the study years and higher weed pressure after flax. 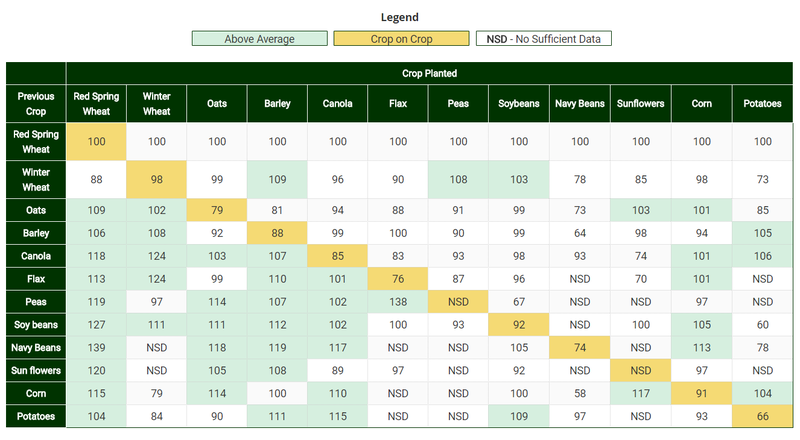 In comparison, crop insurance data from the Black soil zones shows that spring wheat planted on flax stubble performs comparatively well (Table 1). Other cereal crops that are also reliant on mycorrhizal fungi populations like corn can do well on flax stubble. Generally speaking, seeding an oilseed on an oilseed is not recommended. However, there is value in having flax in the rotation for other oilseed crops. For example, blackleg severity in canola was the lowest following a diverse crop rotation (Wheat – Canola – Wheat – Flax) that included flax. Few studies have evaluated flax stubble for pulses. Some research has shown yields of peas were higher on flax stubble than on pea stubble except under drought conditions. Flax may be beneficial to succeeding crops in the semi-arid Prairies because it tends to deplete soil moisture less than other oilseeds like sunflower, safflower and soybean. The additional subsoil moisture left after flax in dry years will help the subsequent crop if another dry year occurs. If a dry situation continues next spring, fields with flax stubble could be targeted for seeding crops with highest anticipated profit. Crops that benefit from late season moisture such as soybeans may benefit from increased soil moisture deeper in the soil profile. Practices that increase snow trapping (e.g. stubble height) and reduce volunteer flax and/or weed populations may be beneficial to increase surface soil moisture following flax. Table 1: Relative yield response (% of 2010 – 2015 average) of Manitoba crops sown on large fields (> 120 acres) of various previous crops (stubble) in rotation – standardized to Red Spring Wheat. Flax is sensitive to many herbicides, so prior to choosing land for flax production herbicide residue history should be verified. If the specific herbicide history is unknown, it is possible to send soil samples for residue analysis to an accredited lab. Droughty conditions in 2017 may lead to residual herbicide persistence in soil so extra diligence should be taken in 2018. Specifically, products used for Clearfield® lentils, peas and canola require two growing seasons prior to sowing back to flax. More information on potential residue concerns may be released, so always check with the marketing company and Guide to Crop Protection. If unsure, check your local guide to crop protection. The primary mechanism for nitrogen (N) to enter plant roots is via mass flow with soil water. This means that in dry soil moisture conditions yield potential and N response is limited. Preliminary soil test results from the Northern Great Plains shows high soil N (i.e. above 100 lbs/ac) in soils affected by the 2017 drought . 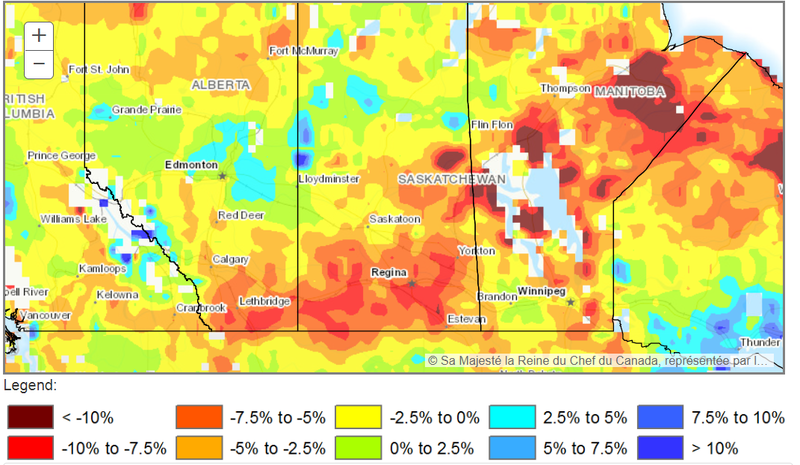 Therefore, drought affected areas in the Canadian Prairies may follow similar trends. The best way to know where soil nitrate levels are at is to soil test in fall prior to tillage operations. Heading into spring 2018, producers should consider modifying fertilizer N applications based on the N supplying capacity of the soil (i.e. soil moisture). Find key considerations when applying nitrogen fertilizer in the fall here. Fall weed control can be an important management tool for targeting certain weeds, especially for an uncompetitive crop like flax. Flax has limited in-crop herbicide options so making sure fall-applied herbicides are considered can go long way to setting up your flax for success. Precipitation towards the end of harvest and soil moisture will have influenced late season weed flushes. Late fall herbicide applications are more effective for winter annual weeds (e.g. cleavers, shepherd’s purse) than early fall so continue monitoring fields for seedling emergence. Find 5 considerations for fall weed control here.